Tiina Kivinen (b. 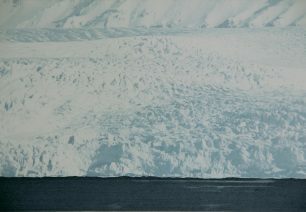 1971) is an internationally operating artist, and the only Finn to have won the H.M. Queen Sonja Print Award. The exhibition now being held at ARTag Studio is an introduction to a larger ensemble next summer. In this vast project Kivinen deals with the role of landscape and landscape perception as part of environmental protection. The roots of nature conservation are in landscape protection. Now that the melting glaciers symbolise the threats of climate change, and forests are referred to as carbon sinks, it is natural to resurface landscape as part of the imagery of environmental protection. Kivinen has been working on this project both at a plot of forest she owns, as well as in Svalbard. INVITATION/ Opening on Tuesday 29.8 5-7 p.m. Welcome!